Ever wonder how Russians feel about corruption? This chart shows Russian attitudes towards high-level government corruption. Russian opposition leader Alexei Navalny was arrested at his apartment just before taking part in an anti-corruption protest in Moscow recently. His wife tweeted the news of his arrest as crowds prepared to descend on Tverskaya Street near the Kremlin. Navalny had moved the rally there from a different location in the capital. Even though his initial request to hold a demonstration was granted by the authorities, he decided to change location, claiming they prevented him from hiring key items such as sound equipment and a stage. After shifting the focus of his event to one of Moscow's main thoroughfares, Navalny was always on a collision course with the police, unsurprisingly resulting in his arrest. That's nothing new for the former lawyer who has been arrested countless times over the years, most notably in 2012 when he was accused of embezzlement and fraud, charges he denied. At least 5,000 attended protests in Moscow and more went to events in over 200 other cities, providing an indication of how much support Navalny actually has ahead of his plans to contest next year's presidential election. Police also followed through on their threats to break up the rally, arresting hundreds of people. Images of the arrests will certainly help Navalny's cause and he will also undoubtedly be helped by a survey from the Levada Center which shows that Russians are angry about high-level corruption in the government. The research found that 47 percent of people think corruption has taken a significant hold in the government while 32 percent think it has fully permeated it from top to bottom. 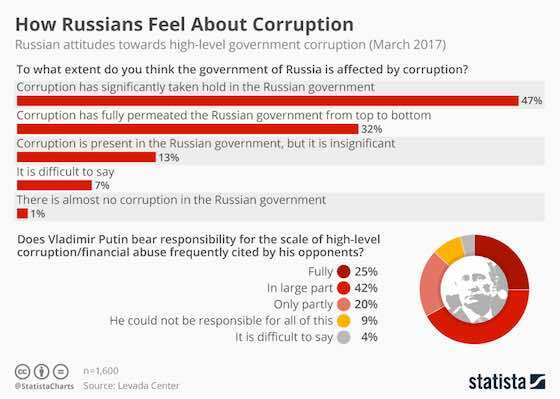 Interestingly, 25 percent of those polled think Vladimir Putin bears full responsibility for the corruption and financial abuse frequently cited by his opponents. 42 percent said the Russian president is responsible in large part and only 9 percent say he could not be responsible for all of it. Even though Navalny wants to contest next year's elections, authorities say he is barred due to his fraud conviction, a conviction he feels is fabricated. Even though that theory might gain more traction after his latest arrest, Navalny will find it extremely difficult to dislodge Putin who nevertheless enjoys very high approval ratings. Europe: "Russian Attitudes Towards Corruption"